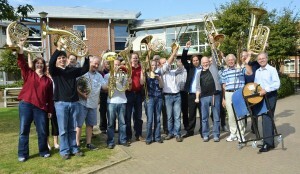 The Alpine brass section – plus wind machine! 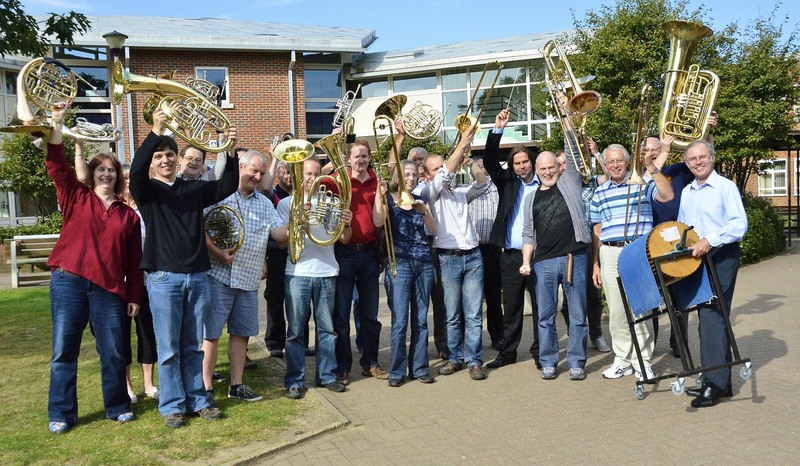 St Albans Symphony Orchestra (SASO) has celebrated the life of a woman known to many in the city as ‘”the little lady on the bicycle” by performing one of the biggest and loudest pieces of classical music ever written. A legacy left by Babs Yule, a long-time friend of the orchestra who died aged 90 in 2010, enabled musicians from SASO and guests to spend two days rehearsing Richard Strauss’s Alpine Symphony. Scored on an extravagant scale, the work requires extra players in all sections and includes parts for a wind machine, a thunder sheet, cow bells, an organ and four rarely heard Wagner tubas. The workshop, held at Townsend Church of England School in St Albans, attracted more than 90 players who attended specialist tutoring sessions as well as rehearsals, culminating in an informal play-through for family and friends. He added that the workshop’s success made it likely that a similar event would be held next year: “After scaling the heights of the Alpine Symphony you tend to to ask ‘how do you follow that?’ Fortunately we’ve got till next year to come up with something equally extraordinary, ” he said. SASO is, meanwhile, preparing for it’s new season, which starts in St Saviour’s Church on the afternoon of Sunday 21st October with its popular children’s concerts. These are followed on Saturday November 10th by evening performances of the Second Symphony by Sibelius and excerpts from Wagner’s The Valkrie. The traditional New Year concert in St Albans Abbey will feature Johann Strauss favourites and Gershwin’s American in Paris, while other concerts in 2013 will Beethoven’s Violin Concerto (played by Magnus Johnston) and Holst’s Planets suite.